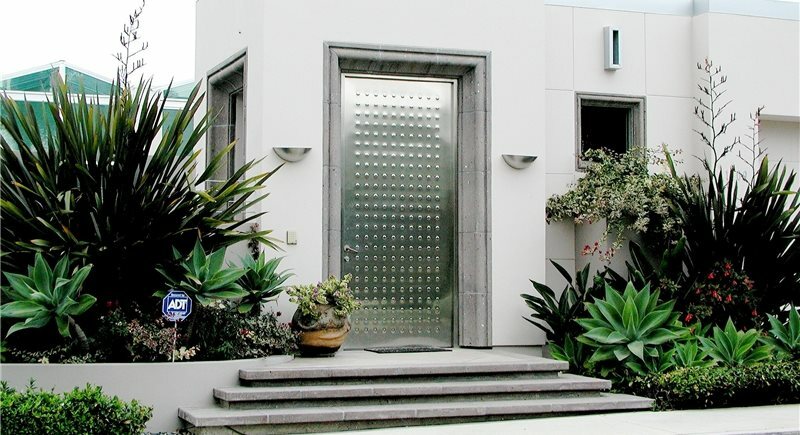 While this home features a very small stoop, the integration of twin pedestals and turquoise ceramic balls help to expand the point of arrival. 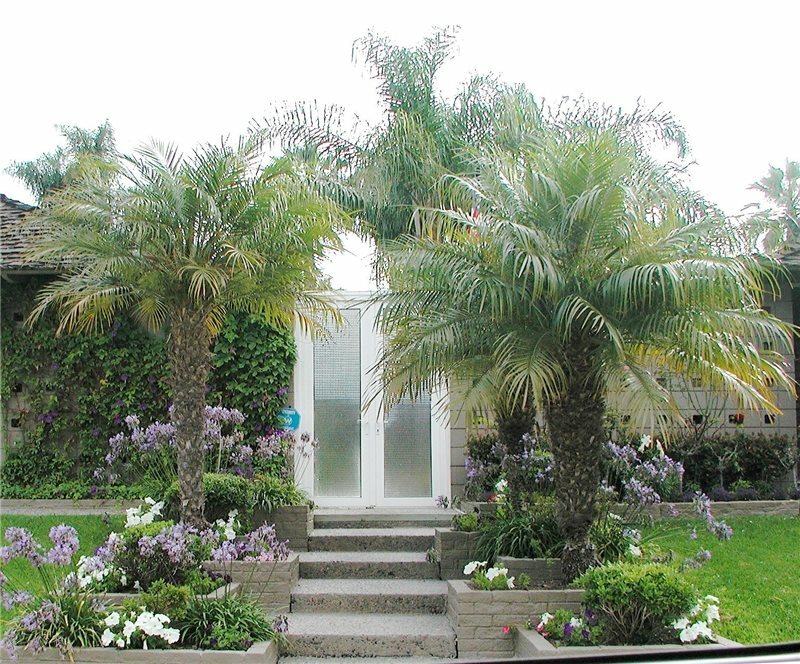 For homes with difficult side entries, the use of diverse and detailed planting as well as the enclosure of an overhead arbor draw visitors in with a promise of surprise. 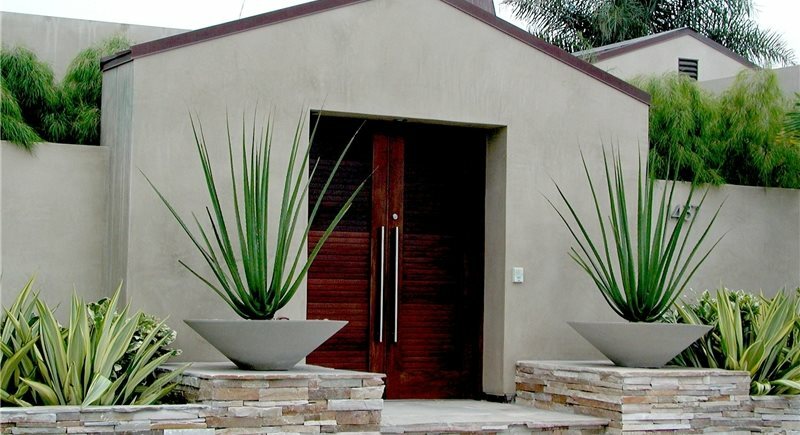 This small stoop offers little interest until the designer opted for matched concrete bowls, each featuring a haute modern species of Sanseveria. 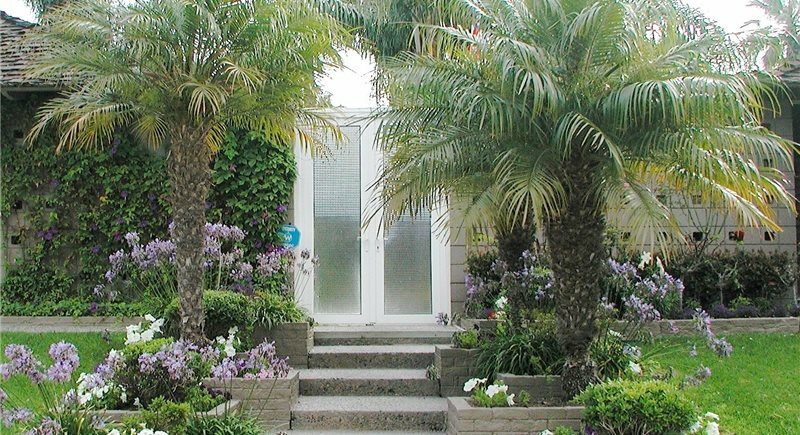 A recessed entry door pushed up against a wall is marked by gently curved flagstones with the presence of a palm's wide trunk and canopy pointing visitors toward their destination. The extension of this paving allows women with stiletto heel shoes to step out onto the solid surface rather than irregular, soft and coarse pea gravel. Extending the depth of each step's tread proves a more attractive alternative to bunched steps and sloped walkways. This awesome entry illustrates the benefits of overly wide steps as well as cantilevered tread nose which contains hidden lighting bars that make them stand out at night. When real estate agents talk about curb appeal, they're referring to the overall impact of a home when a prospective buyer drives by. This first impression is also shared by everyone who visits your home for the first time. 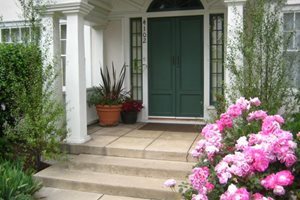 But curb appeal is a brief impression compared to the arrival experience, which requires specific design concepts be integrated into a front yard. Help your designer get this right and your home will literally beckon visitors to come inside. 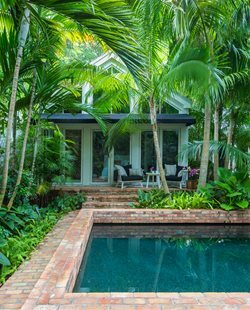 What makes a house exceptional is how its landscape greets people through a series of experiences, all of them well known to every landscape architect. 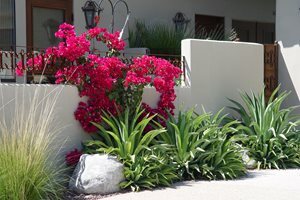 When you come to understand them as well, you can help the designers exploit every opportunity when dealing with the conditions, challenges and opportunities of a home's front yard. The primary experience is a vehicular one because most of us arrive in a car. It's about how they enter and park in the driveway or at the curb out front. Second is the pedestrian experience. This deals with your visitors as they transition from the car to the front door on a walk or pathway. Third is the sense of arrival, that tells the visitor he or she has reached their destination. It is heavily dependent on the combined impact of porch and front door. 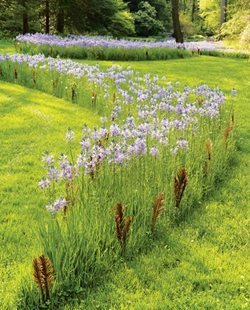 Your landscape designer must integrate all three of these experiences correct in a cohesive, and more importantly, intuitive way. When done properly, the resulting composition will become your personal greeting to everyone who visits day or night. Like it or not we are an automotive society, and much of what we see is from the front seat of a car. A good designer also knows this and strives to avoid the frustration caused when it isn't clear where a visitor should park. When designing a larger homesite, the vehicular circulation is even more vital, hinging on designating the location of guest parking or a drop-off point. You can designate this parking place as different from the rest of the driveway in a variety of ways. 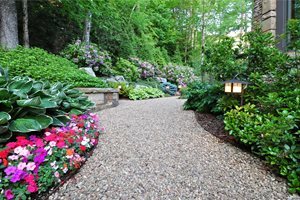 Consider special paving that upgrades this location from the concrete, asphalt or gravel driveway. Above all, make it clean and safe with material dense enough to allow you to steam clean oil stains that may result from delivery vehicles. Avoid surfacing that involve narrow gaps that are hazardous to women's stiletto heels. Provide subtle yet adequate lighting to delineate the parking area after dark. If there is attractive planting or a vulnerable tree close to the paving edge, add a curb or wheel stop to limit bumper overhang damage. See how new concrete steps and pilasters provide the look of a grand entryway in this courtyard. Have you ever stepped out of your car and wondered where to go next? It's not as uncommon as you think because builders of large developments are notorious for failing to create intuitive connections at this point. 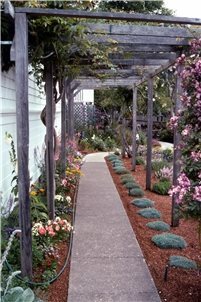 Create a walkway wider than the minimum four feet and pay attention to the details so your entry will beckon visitors as if you've rolled out a red carpet. 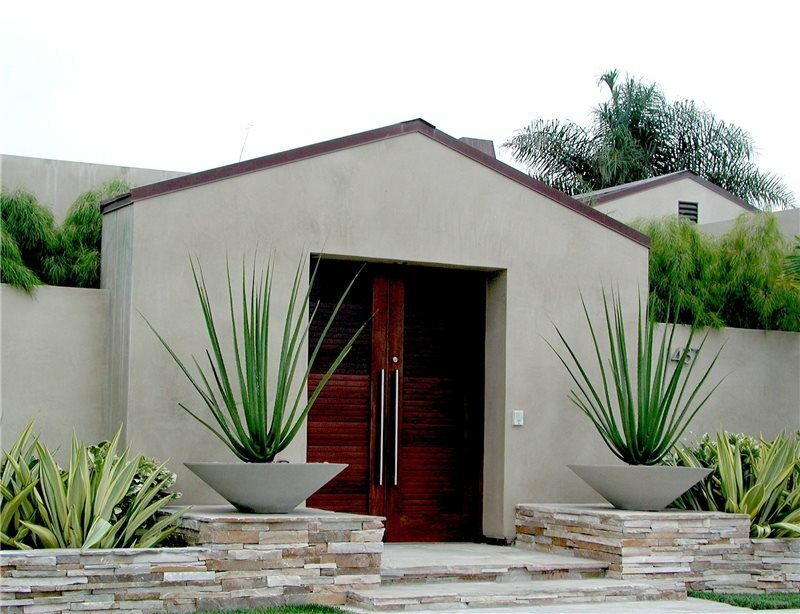 This entry walk should be a central part of an integrated front yard landscape. Continue the look and feel of your special paving to the front porch and inside the foyer for a seamless connection. To avoid liability, be sure the surfacing you choose is slip-resistant in all weather. Install sufficient lighting at path level to clarify its edges and grade changes, particular if the walkway is sloped. If steps are involved, consider stretching the tread while maintaining riser height. This roomy tread more gradually takes up the grade. If the walkway curves, wider treads accentuate its beauty. Rather than depending solely on path lighting in the adjacent planter to show visitors where the edge of pavement lies, consider the aesthetics of lighting integrated into the steps themselves. Louvered vents set into the face of each step riser offers spots of brighter light along with easy bulb replacement. More complex are linear light bars built-in beneath the cantilevered tread nose of a step. If the visible riser is veneered with colored tile and bathed in linear lighting, this option can contribute outstanding night time sculptural qualities. When lots became smaller, builders began designing homes with the garage more prominent than the front door. 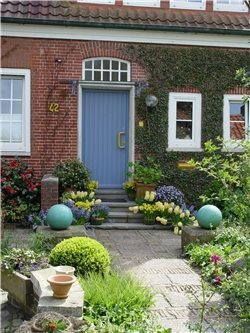 These front doors can be too narrow, recessed into the facade or pushed up against the garage. Some may even lack a porch altogether. There is little to no sense of arrival, and only a vague sense of place. The front door is the most important part of the front facade. Every decision made should be considered for its support and accent. The benefit to having a large stoop allows those in a group to stand comfortably as you come to the door. An arbor or overhead structure can be added to make this space more sheltered in inclement weather while punching out the visibility of a minimal doorway. 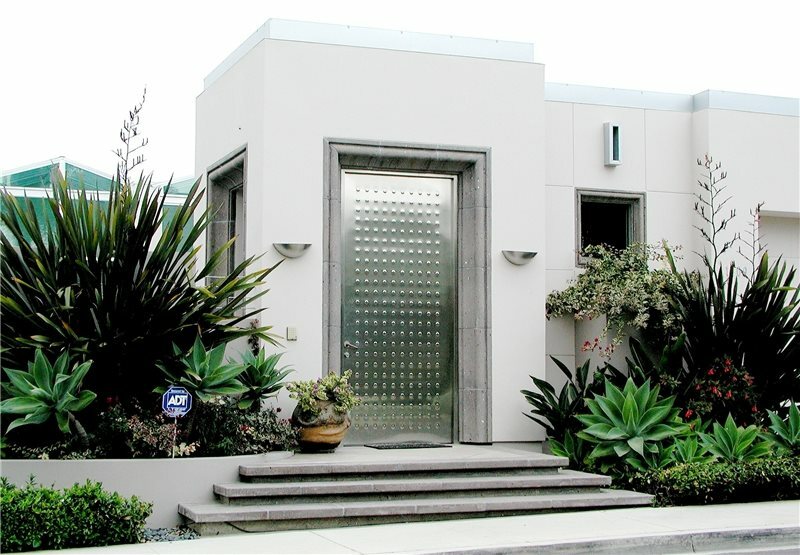 If there are steps up to this entry level, make them as wide or wider than the entry walk to avoid a bottleneck. 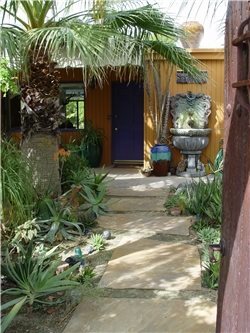 Wider steps offer opportunities for beautiful pots to flank the entry. 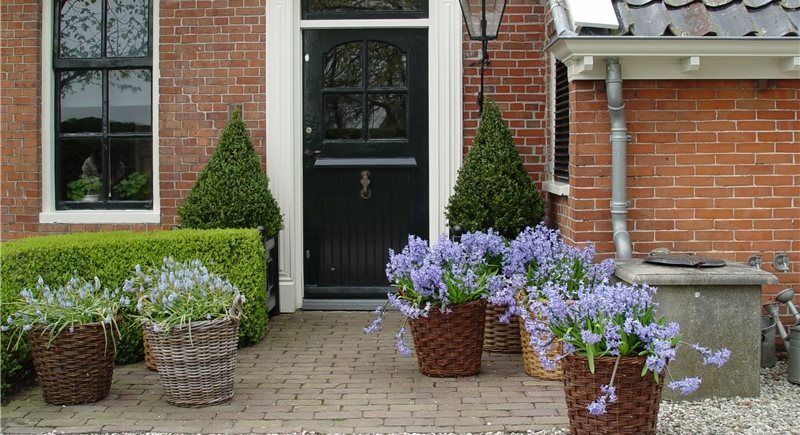 Planting at the stoop is another way to upgrade an entry. 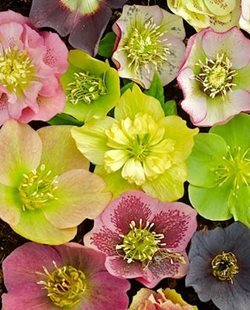 Spring flowering or fall color accent trees are the most affordable way to emphasize this location. Adding detailed close up planting gives waiting guests something beautiful to peruse. Ambient lighting or attractive light fixtures can further highlight the entry location after dark. When reviewing your designer's plans, make sure all three experiences are well detailed. Follow a visitor in your mind, visualizing where they park, how they walk to your door, and what they feel when they get there. Most important of all, turn that vision around to know what they'll see and feel when the party's over and its time to go home.